Camp Minsi depends on the service and support of Scouts and Scouters to help to sustain our property and provide quality camping facilities and programs. Below are several ways you can get involved and help give back to Scouting. Saturday, May 21, 2016 is a unique opportunity for service, fellowship, and outdoor recreation at Camp Minsi! Help us set-up camp and prepare for the busy summer camp season. Take the opportunity to bring your unit to camp for Beaver Weekend and check out the camp, participate in special programs, and give back to Scouting with friendly service. This event is 100% free! If interested, register your unit today! 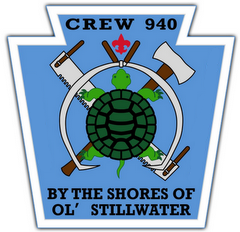 Venturing Crew 940 is a youth organization focused on service at Camp Minsi. The Crew holds monthly service and fellowship weekends at Camp Minsi. To get involved connect with us on Facebook at facebook.com/crew940. The Order of the Arrow's Witauchsoman Lodge #44 provides service to camp. For more information on the OA programs and service opportunities for arrowmen at camp visit www.witauchsoman.org. As a non-profit organization, Camp Minsi depends on the generosity of supporters to sustain our mission of providing youth with a quality camping facilities and programs. Whether you are able to help us with your service, monetary donations, in-kind donations, or by donating other items, we are grateful for your support. MONETARY DONATIONS—There are many ways to contribute financially to the camp, all of which are tax-deductible. IN-KIND DONATIONS—We also welcome an extra hands to help with the upkeep of our 1,200 acres of buildings and grounds. We are always looking for contractors, electricians, plumbers, building designers, painters, landscapers, and those with a desire to serve. Your help, no matter how small or how big, is most appreciated. OTHER DONATIONS— If you have something that you think could benefit Camp Minsi and would like to donate it to support Scouting, please feel free to contact us as it might be something that we can utilize.